(Notenuf) Buy it from Insound From the moment I heard the name Ã¢â‚¬ËœA Sunny Day In Glasgow' I wanted to love this band. It seems to conjure up vivid images of grim industrial skylines and alienating urban sounds, and in Scribble Mural Comic Journal this Philadelphia-based band has created a record that really befits the moniker. The fun begins with Wake Up Pretty, which is built around a hazy, monotonous loop. After a minute, a distant and detached female vocal which ushers the track into No. 6 Von Karmen Street, a fragmented and disorientating collage of sounds set to a driving dance beat. A Mundane Phonecall to Jack Parsons is more conventional, but only just. It sees the band utilising the classic shoegaze trick of burying a potentially great pop song beneath multiple layers of more abstract sounds, in this case a heavy rhythm track and a jarring repetitive riff. This technique is repeated with even greater success on the sublime standout track, 5:15 Train, which features throbbing guitars and more dreamy vocals. From the moment I heard the name 'A Sunny Day In Glasgow' I wanted to love this band. It seems to conjure up vivid images of grim industrial skylines and alienating urban sounds, and in Scribble Mural Comic Journal this Philadelphia-based band has created a record that really befits the moniker. The fun begins with Wake Up Pretty, which is built around a hazy, monotonous loop. After a minute, a distant and detached female vocal which ushers the track into No. 6 Von Karmen Street, a fragmented and disorientating collage of sounds set to a driving dance beat. A Mundane Phonecall to Jack Parsons is more conventional, but only just. It sees the band utilising the classic shoegaze trick of burying a potentially great pop song beneath multiple layers of more abstract sounds, in this case a heavy rhythm track and a jarring repetitive riff. This technique is repeated with even greater success on the sublime standout track, 5:15 Train, which features throbbing guitars and more dreamy vocals. There are a few slight miscues here, most notably C'Mon's grating, atonal guitar (I think) riff which ruins an otherwise decent enough song, but these are few and far between. Some of Scribble Mural Comic Journal's more drone-based tracks such as the five minute plus instrumental Panic Attacks Are What Makes Me "Me" seem unremarkable when taken out of context, but in helping to provide a welcome contrast to the more immediate melodic offerings they are key to this album's success. Scribble Mural Comic Journal's final track The Best Summer Ever is by some distance its most conventional. After fifty minutes of dreamy shoegaze, it practically bursts out of the speakers like the first welcome ray of summer sun. The vocals are nearly decipherable and the guitars even sound like guitars - it's almost pure pop music. 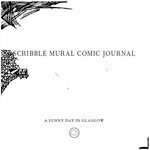 Scribble Mural Comic Journal is a beautiful, brilliantly constructed album and one of the best and most inventive dÃ©buts I've heard in a long, long time. Hunt it down and cherish it.